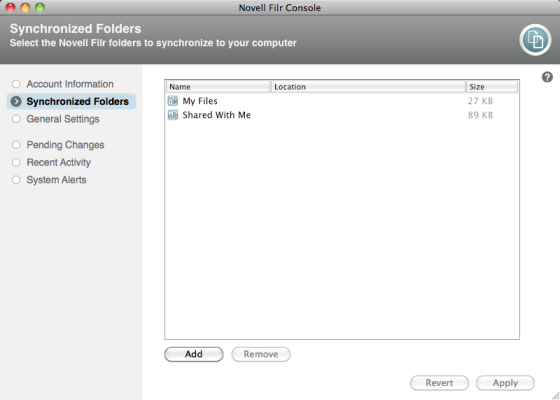 Novell Filr allows you to easily access all your files and folders from your desktop, browser, or a mobile device. In addition, you can promote collaboration around your files by sharing files and folders with others. 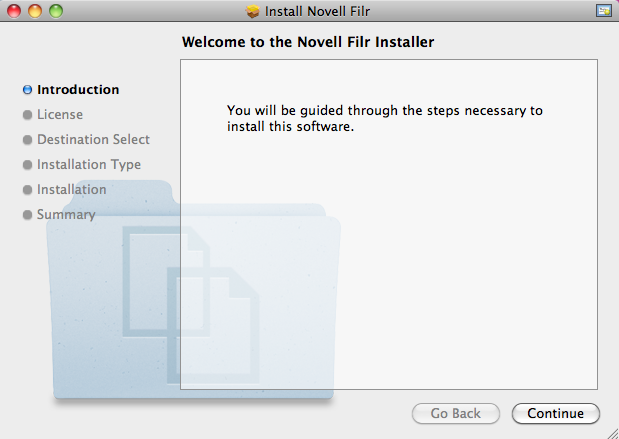 For more general information about Novell Filr, see About Novell Filr in the Filr Web Application User Guide. This Quick Start describes how to use Filr from your desktop. You can synchronize your Novell Filr files with your computer, and then modify the files without accessing the Filr site directly. Additions, modifications, and other actions are synchronized between Filr and your computer. Your Filr administrator must enable the Filr desktop application to be used with the Filr site before it can be used as described here. For information about how administrators can enable this functionality, see Configuring the Filr Desktop Application to Access Files in theNovell Filr 1.0.1 Administration Guide. The Filr desktop application for Mac is supported on Mac OSX 10.7 and later. For information about how to configure files to synchronize, see Configuring Folders to Synchronize. Synchronization from the Filr desktop application to the Filr server occurs immediately when changes are made; synchronization from the Filr server to the Filr desktop application occurs at an interval designated by your Filr administrator. The default is every 15 minutes. If the server becomes unavailable, the desktop client attempts to contact the server every minute until a connection is re-established. You can manually synchronize files if you do not want to wait for the scheduled synchronization. For more information, see Manually Synchronizing Files. My Files: Files that are located in your My Files area on the Filr site are synchronized to your workstation by default. When you add files to the My Files folder from your workstation (Users/userid/Filr/My Files), the files are automatically synchronized to Filr at the next synchronization. Shared with Me: Files that are located in your Shared with Me area on the Filr site are synchronized to your workstation by default. You can edit files in your Shared with Me area and the edits are synchronized to Filr. However, you cannot add files to the root of the Shared with Me folder from the Filr desktop application on your workstation (/Users/userid/Filr/Shared with Me). If you do, the files are not synchronized to Filr. You can add files to folders that have been shared with you, if you have Contributor rights to the folder. Net Folders: Files that are located in Net Folders are not synchronized to your workstation by default. You can configure Net Folders to be synchronized, as described in Configuring Folders to Synchronize. Files located at the root of the /Users/userid/Filr folder cannot be synchronized. Instead, add files to one of the appropriate subfolders (My Files or Net Folders; you cannot add files to the Shared with Me folder). If you delete a document or folder from the Shared with Me area, and that document or folder has been directly shared with you, it is no longer synchronized to the Filr desktop application, and the documents and folders remain on the server. If you delete a document or folder that is a subfolder of a folder that was shared with you, or if the document is located in a folder that was shared with you, the document or folder is deleted, if you have sufficient rights to delete it. On your workstation, access the Filr Web client from a browser. For information about how to start Novell Filr from a browser, see Accessing Novell Filr from a Web Browser in the Novell Filr 1.0.1 Web Application User Guide. Click your linked name in the upper-right corner of the page, then click Download Filr Desktop App. After the download finishes, open the NovellFilr-version.pkg file. You must have Administrator privileges on the workstation to run the file. If you do not have the Microsoft Visual C++ 2013 Redistributable Package installed on your workstation, you are prompted to accept a license agreement and install it. Microsoft .NET Framework 4.5 is not supported on Windows XP. Change the installation location for the Filr desktop application, or simply click Continue to accept the default location. Start Filr by running it manually from Launch Pad or from /Applications/Novell Filr, then continue with Configuring the Filr Desktop Application for the First Time. After you have downloaded and installed the Filr desktop application for the first time, as described in Downloading and Installing the Filr Desktop Application, you are prompted to configure it. This process includes entering account information, choosing which folders to synchronize, and choosing where to store information on your computer’s file system. Click Start to begin setting up the Filr desktop application. Depending on how your Filr system is set up, you might have to enter the port number. For example, https://Filr.mycompany.com:8443. Username: Specify the Filr username that you use to log in to the Filr site. In the Synchronized Folders section, notice that files in your My Files and Shared with Me folders are synchronized by default. Click Add in the Synchronized Folders section, then click the Net Folders tab. Navigate to and click the Download icon next to the Net Folders that you want to synchronize, then click OK.
Click Add in the Synchronized Folders section, then click the My Files or Shared with Me tab. Click the Synchronized icon at the column heading to stop synchronizing all files and folders in the My Files or Shared with Me areas. You can then click the Download icon next to specific folders that you want to synchronize. The Synchronized icon indicates that files are being synchronized. The Download icon is displayed to indicate that files in your My Files or Shared with Me areas are no longer being synchronized. Filr Folder: Click Browse if you want to change the installation location for the Filr desktop application; or simply keep the default location. Start Novell Filr at login: Keep this option selected to have the Filr desktop application start when you turn on your workstation. Click Next to review your selections, then click Finish. When you first configure the Filr desktop application, you can choose which folders you want to synchronize. My Files and Shared with Me are synchronized by default; Net Folders must be manually configured to synchronize. You can configure folders to be synchronized during the initial configuration or any time after the initial configuration. You must have appropriate View rights on a Net Folder in order to synchronize it. For optimal performance, the Filr desktop application should not be configured to exceed the synchronization limits. For information about synchronization limits, see Synchronization Performance Limits. Click Synchronized Folders to display the folders that are currently being synchronized. 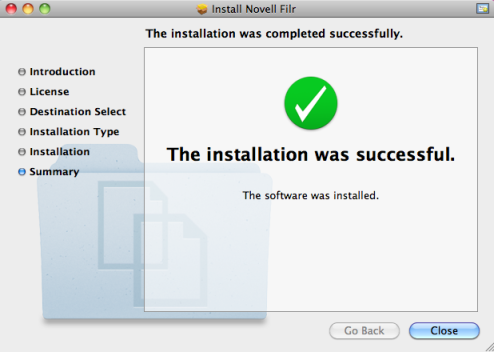 The Add Novell Filr Folders dialog box is displayed. Select the My Files, Shared with Me, or Net Folders tab, depending on the location of the folder that you want to synchronize. (Optional) Click a folder name to navigate to subfolders. Click the Download icon next to the folder that you want to synchronize. Click the Download icon at the top of the folder list to synchronize all folders. When you select a folder to synchronize, subfolders are also synchronized. The Filr administrator must enable Net Folders to be synchronized to the Filr desktop application. If the administrator has not enabled a Net Folder to be synchronized, a red icon is displayed next to the folder and you cannot synchronize it. Files in a Net Folder might not synchronize immediately, depending on the way your Filr administrator implemented file synchronization. If there are files in a Net Folder that are not synchronized, try accessing those files first from the Filr Web application or the Filr mobile app. If files still fail to synchronize to the Filr desktop application, contact your Filr administrator. Repeat Step 4 through Step 6 to synchronize additional folders in your My Files, Shared with Me, or Net Folders locations. (Optional) Click the Synchronized icon next to any folder that you want to stop synchronizing. You cannot stop synchronizing a subfolder if the parent folder is being synchronized; you must stop synchronizing the parent folder. Click the Synchronized icon at the top of the folder list to stop synchronizing all folders. The folders that you have selected to be synchronized are listed on the Synchronized Folders page. The size of the folder is displayed next to the folder, in the Size column. Ensure that you want to synchronize the folders that are listed, then click Apply. If you have selected a folder that is over 500 MB, you are warned before proceeding. You can access the Filr folder directly from your file system. The Filr folder is in the Places/userid directory. You can manually synchronize files between Filr and your computer if you do not want to wait for the scheduled synchronization. Files must be closed before they can be synchronized. Navigate to the file that you want to synchronize. Option-click the file, then click Synchronize now. Click the Filricon in the menu bar, then click Visit Filr on the web. Option-click the file, then click Comments. Option-click the file or folder, then click Share. If a synchronization is in process or if the address book is being cached, the Filr Share dialog box might not be immediately displayed. In the Add a User, Group, or Email field, begin typing the name of a user or group that you want to share with, then click the name when it appears in the drop-down list. Specify the complete email address of the external user that you want to share with, then press Enter. (Optional) Click Make Public to make the item publicly available. Then in the Shared with section, tap the All users user that was just added, and set the access control settings for the public. Option-click the file or folder for which you want to view the Filr properties. NOTE:You should not synchronize files to a location on a network that can be accessed by multiple computers. If the Filr folder is on a network location that is accessed by multiple computers, synchronization issues can occur when Filr files accessed from either computer are out of sync with each other and with the Filr server. Ensure that no files from the Filr folder are currently open. Click General Settings, then click Browse to browse to the new location on the file system where you want the Filr folder to reside. Click Continue to change the location of the Filr folder. When you first configure the Filr desktop application, you specify your account information and Filr server information. Click Account Information in the Novell Filr Console dialog box. Account Name: Specify a descriptive name for the Filr account. A folder with this name is created in your user directory in the file system. This option can be disabled by your Filr administrator. Data quotas can be enabled by your Novell Filr administrator in order to limit the amount of data that is stored on the Filr site. For information on how the Filr administrator can enable data quotas, see Managing Disk Space Usage with Data Quotas and File Restrictions in the Novell Filr 1.0.1 Administration Guide. If data quotas have been enabled on your Filr site, you need to understand what counts toward your data quotas, the different kinds of data quotas that exist, and how you can view the current data usage, so you can know when you are approaching the allotted data quota. If you meet your allotted quota, Filr enables you to purge files and attachments that you have previously deleted. Click the Filr icon in the menu bar. For information about how to manage your data quota from within the Filr Web application, see Managing Your Data Quota in the Novell Filr 1.0.1 Web Application User Guide. If a document is edited at the same time from various locations, conflicts can arise. 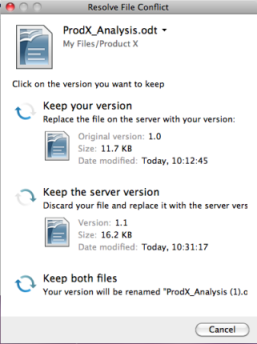 Keep your version: Replaces the file on the Filr server with your version. Keep the server version: Discards your file and replaces it with the version on the Filr server. Keep both files: The file on the Filr server is saved as the original file, and your version of the file is renamed. If Filr files are not being downloaded to your workstation as you expect, or if you are experiencing other unexpected behaviors, see the filr.log file for more information. Click Finder, then from the menu bar, click Go > Utilities. Locate the Log List (navigation panel) on the left side of the console. If the Log List is not currently displayed, click View > Show Log List in the menu bar. In the Files section, expand ~/Library/Logs, expand Novell, expand Filr, then select filr.log. After information in the filr.log file exceeds 1MB, older log information is moved to the filr.log.1, filr.log.2, and filr.log.3 files. Move /Applications/Novell Filr to the trash. You need to delete the Filr desktop application metadata contained in /Users/username/Library/Application Support/Novell/Filr. Because the Library directory is usually a hidden directory, complete the following steps to accomplish this. Click Finder, then from the menu bar, click Go > Go to Folder. Specify ~/Library, then click Go. Double-click the Application Support folder. Move the Filr folder to the trash. You need to delete the Filr logs contained in /Users/username/Library/Logs/Novell/Filr. Specify /Library/ScriptingAdditions, then click Go. Move the FilrFinderPluginLaunch.osax file to the trash. Click Applications > Utilities > Keychain Access. 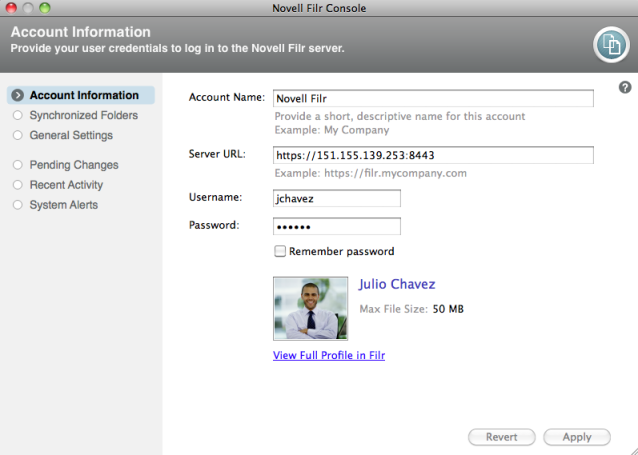 Delete any passwords that have the names beginning with Novell Filr. After the Filr application, metadata, log files, and credentials have been deleted, empty the trash (double-click the Trash icon, then click Empty). For a list of known issues, see the Novell Filr Desktop Application Readme.